The LMBC novices took the Clare Novices’ Regatta by storm on Saturday with the most successful campaign the boat club has seen yet. The Maggie novice contingent dominated the prize-giving ceremony at the end of the day as 3 of our crews arrived to claim 3 of the 4 prizes of the day. Let’s just say that the Clare common room was looking very red… Yeah Maggie! The girls smashed their first race against Medwards NW2, winning by an impressive 3 boat lengths. In the next round they beat Magdelene NW2 by an equally large distance, followed by another win in the semi-final round against Jesus NW2 to award them a well-deserved place in the final. Tensions were high at the starting line as we lined up against Downing NW2 ready to battle it out for 1st place, and the race was off to an exciting start, but our girls quickly made light work of pulling away. Within 30 seconds Downing were long lost as the girls flew down the reach with both speed and faultless technique, winning both the race and consequently the division with 3 boat lengths. Coaches Elle and Anna are immensely proud of the progress NW2 have made over novice term and are especially impressed with how the girls maintained composure and a strong determination throughout the 6 hour competition. Having a strict no-crab-policy in place, they are also happy to say that not one crab was caught during any of the 4 races (can the same be said for NM2?) - bring on Fairbairns! “There are few things more unstoppable than the force of Mother Nature, but the NM2 2018 Clare Novices campaign was certainly one of them. Indeed, despite suffering from two crabs in both the first round against Hughes Hall and the second round against St Cats, both were won comfortably by at least 4 lengths. From then on, the boys composed themselves, cut the crabs out of their diet, and to put it simply, utterly destroyed every single one of their opposition henceforth. Calmly rowing at rate 28, NM2's superior fitness allowed them to easily pull away from the choppy rate 34 half-slides of other crews, with the final won as easily as the first race - by more than 4 lengths. The first race against Jesus was over smoothly, with Lady Margaret pulling out to clear water within a minute. The second race was against Fitz, who were runners-up at Emma Sprints. They rowed neck-and-neck with us for the first half of the race, even momentarily edging ahead despite being on the outside of the kink on the Reach. In the end the fitness of the Maggie crew came through and we rowed away from them in the second half. Our semi-final was against Caius NM1, who had won all the novice races so far this term and rowed incredibly well for a novice eight. We knew that this race could very much represent our "final" of the regatta, whatever the result. As we came round the kink in the Reach, Caius had capitalised on their lane advantage and pulled out three quarters of a length ahead, and extended this to nearly a length by the railway bridge. NM1 was down, but not yet out – we knew that from the bridge the end was near, and they stepped out tremendously to take half a length within the next 10 strokes. Could they make up the remaining distance before the course ran out? We didn't get to find out - at this point the Caius boat was drifting across onto our side of the river, and ended up causing a blade clash with 100m to go. As the leading crew and with plenty of space on their side of the river, they were disqualified and Lady Margaret were though! Fortunately the final turned out far less fraught and we rowed away from First and Third within the minute, securing LMBC's first men's cup win since 2011! Prophetically, it was noticed that the last four (distinct) clubs to have won it were the exact ones we faced on our route though the competition this year. It was a fantastic result, but what NM1's coaches were most pleased by was the crew's composure under pressure throughout the day. The cracks certainly showed (there were a number of quickly-saved crabs throughout the day! ), but every member of the boat rowed calm and long in all their races, often under-rating their competition even as we moved ahead. Looking ahead to Fairbairns we obviously have to set our sights high. We hope, because in our race against Caius our pace came through most towards the end, that over the much longer course we may be the fitter crew. Having said that, we understand some injury befell Caius in the regatta, which may yet make a difference if, as we hope, it gets well soon. 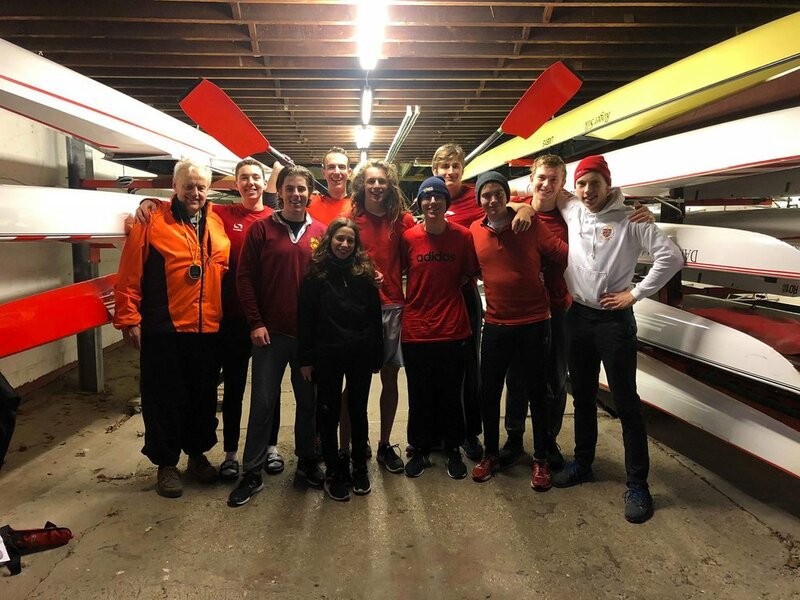 Our NW1 this year has been one of the keenest novice crews we’ve seen in the boat house in recent history - making their short-lived time at Clare novices a very underserving one! Maggie NW1 made an impressive start to their division with an easy win on Selwyn NW1, pulling away within the first 10 strokes it was clear that they weren’t to be beaten. NW1’s second race saw them going off strong until a bad crab and stuck blade forced them to stop the boat and reset. They were gaining rapidly on Pembroke up until the end, but sadly couldn't quite make up the time lost. Preparing for the first race against Clare NM2, tensions in the boat were high. Competing in the second division against higher boats meant they didn’t know how they’d compare. Thankfully the worries were unfounded as they comfortably pulled away from Clare and beat them with at least 5 lengths to spare. The next race was against an old rival; Robinson NM2 who had narrowly beaten them to the final in Emma sprints. The rematch was a very tight race, but NM3 kept their lead to the finish line. This led to a very amusing (although confusing for bystanders) Maggie NM2 vs Maggie NM3 semi-final. Unfortunately the promise of becoming the new NM2 after a win wasn’t quite enough motivation and NM2 won that race. Nevertheless Maggie NM3 has proven to be a force to be reckoned with: the fastest NM3 by far and even making it into semi-finals in the second division. Having missed out on a place in the Emma Sprints draw last weekend, and entering the Clare Novices’ draw in the quarter-finals against Clare NW2, you might have thought that our NW3 would be left with experience of only one race in two regattas. A rapid start from Maggie gave the girls an early lead over the hosts, before an unrecoverable crab swung us into the middle of the river and the race had to be stopped due to the resulting collision. Restarting halfway up the Reach, we put clear water between us and Clare within a couple of dozen strokes, and by the Railway Bridge we had left them in our dust: the triumph of the underdog. We headed into the semi-final hoping for a Maggie vs. Maggie battle for the Plate; only Downing NW2 stood in our way. Downing accelerated off the start, but we slowly started gaining and then a crab from them gave us the lead. Heartbreak struck as we crabbed to make it one-all. Despite the excellent recovery, Downing managed to slip ahead, and the two boats were neck-and-neck until the Railway Bridge, where the corner favoured the opposition. Still we put up a strong fight and maintained overlap all the way until the line, tiring Downing out before their imminent defeat by Maggie NW2 in the final. We may have lost on paper but boy did we show we can fight. Lower Boat Captains Elle and Richard would just like to say a huge well done to all 6 of the crews who participated yesterday, everyone made us so proud and you are all a testament to the boathouse. There was a real sense of LMBC spirit alive on the river, with ‘yeah Maggie’s’ a plenty, running along the towpath to chase and cheer each other on, meeting up after each race, and the overall sense of really wanting to do well as a whole boat club y rather than just as individual crews. As novice term is nearing its end, we want to thank both the novices and coaches for making it so fun and successful, and yesterday shows just that.